ShutterStem enables apps that are optimized for organizing—and enjoying—a lifetime of photos. 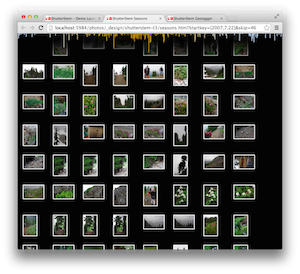 It grew out of dissatifcation with existing tools for shutterbugs: chosing between either inflexible libraries stuck on the big computer at home, or having to somehow upload terabytes of life history to a hopefully-trustworthy cloud provider. I wanted better, and I suspect there are others (e.g. photojournalists or citizens in sensitive situations) that need better. 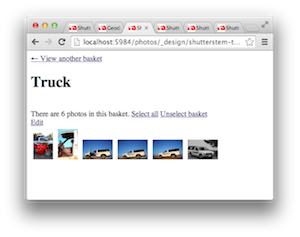 ShutterStem is ultimately envisioned as a scalable, syncable local network appliance. It will provide some polished core features like backup/sync, import/export/upload, basic organization/editing, etc. as well as an open API (with flexible schema) to enable custom integrations and extensions. 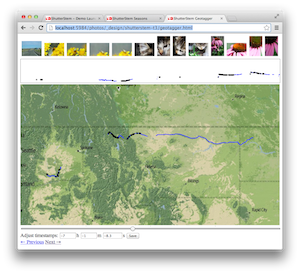 Traditional grid view reenvisioned to give users a feel for the overall "landscape" while navigating a lifetime of photos. Features a horizontally-scrolling daily histogram with seasons reminiscent of icicles and stalactites. As with all the apps, its interface is designed to support both desktop and tablet browsers. Notice this app shares the same underlying data as e.g. Baskets below. A core ShutterStem concept is a single library supporting diverse interfaces: apps optimized for particular workflows and user contexts. Experimenting with organization on very limited devices (e.g eReaders, etc.) and with concepts of how apps could extend each other. The experience isn't great, but you can actually pull up this in a separate window (or iframe) and use it in conjunction with photo selections in the Seasons app above. 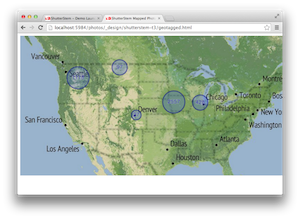 Shows a map of geotagged photos, with concern given to scaling even when thousands of photos are in one location. TODO: this doesn't show the photos/thumbnails themselves yet! NOTE: this requires sample data that I haven't added to this library yet…sorry! 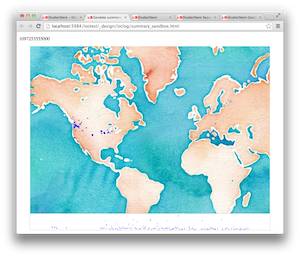 A port of what I wanted for Geotagalog 3.0, much easier using HTML5 and building atop CouchDB than it ever was versus Cocoa/iPhoto! Quick-and-dirty start porting my ancient flCaptionater app to ShutterStem. The idea is that you can get into a nice rhythm (describe, hit enter, describe hit enter…) and add text descriptions to hundreds/thousands of photos per session. 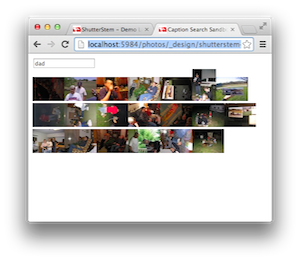 Super simple proof-of-concept instant search of captioned photos. 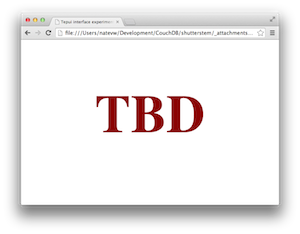 TODO: better stemming/indexing, nicer interface, etc. etc. 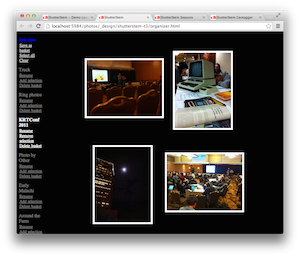 Basically unstarted, but the idea is to make a multitouch (and self-hosted ;-) version of the now-gone Tabblo — a site that let you layout photos and text in kind of a lightbox/scrapbook/webpage style, to share whole stories! Questions/comments/ideas? Wanna try it yourself? Check out the source repository, or get in touch with me directly. 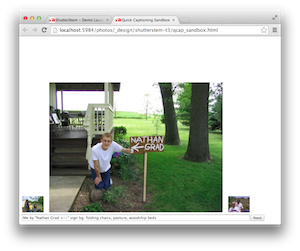 © 2010–2014 Nathan Vander Wilt.